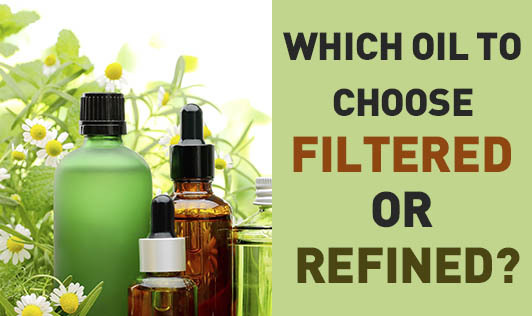 Which Oil to Choose- Filtered or Refined? When you have a reason to choose between wheat bread and white bread, what reason do you have to choose between filtered and refined oil? The advertising media gave refined oils a big hype which made most housewives think twice before grabbing their favorite filtered oil. Advertising as oils with no cholesterol and presence of heart healthy gimmicks, did help the manufacturers achieve their profit targets in the market as the conventional filtered oils took a back seat. Thanks to the lack of intellect in most consumers then, who nevertheless learnt later that no vegetable oil contained cholesterol and any oil can be heart healthy only if consumed in the right amounts. The confusion of choosing filtered oil over refined oil isn't clear yet. So let me give you an overview of both the faces of these types of oils. Refined oils on the other hand, are processed at very high temperatures using a lot of chemicals for refining, deodorizing and bleaching, which also refines the goodness that was present in the oil seeds. Refining oils is equivalent to refining whole wheat to maida or refining whole sugar to the white ones. Refined oils are less priced, have longer shelf life and have higher smoking points. Refined oils are preferred over unrefined oils especially for deep frying and also in processed foods where the aroma and the taste of the oils have to be masked. Prefer oils from nuts and oil seeds for cooking and choose refined oils for deep frying. Oils can be heart healthy only if used in moderation and you could grab the goodness of different oils by using a combination of the right oils.